ADP is not only a key substrate for ATP generation, but also a potent inhibitor of mitochondrial permeability transition pore (mPTP). In this study, we assessed how oxidative stress affects the potency of ADP as an mPTP inhibitor and whether its reduction of reactive oxygen species (ROS) production might be involved. We determined quantitatively the effects of ADP on mitochondrial Ca(2+) retention capacity (CRC) until the induction of mPTP in normal and stressed isolated cardiac mitochondria. We used two models of chronic oxidative stress (old and diabetic mice) and two models of acute oxidative stress (ischemia reperfusion (IR) and tert-butyl hydroperoxide (t-BH)). In control mitochondria, the CRC was 344 ± 32 nmol/mg protein. 500 μmol/L ADP increased CRC to 774 ± 65 nmol/mg protein. This effect of ADP seemed to relate to its concentration as 50 μmol/L had a significantly smaller effect. Also, oligomycin, which inhibits the conversion of ADP to ATP by F0F1ATPase, significantly increased the effect of 50 μmol/L ADP. Chronic oxidative stress did not affect CRC or the effect of 500 μmol/L ADP. After IR or t-BH exposure, CRC was drastically reduced to 1 ± 0.2 and 32 ± 4 nmol/mg protein, respectively. Surprisingly, ADP increased the CRC to 447 ± 105 and 514 ± 103 nmol/mg protein in IR and t-BH, respectively. Thus, it increased CRC by the same amount as in control. 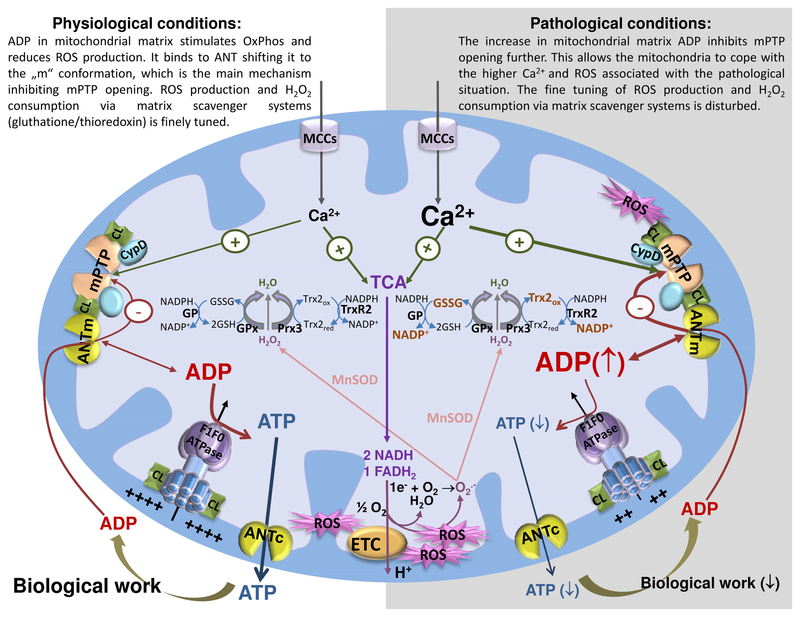 In control mitochondria, ADP decreased both substrate and Ca(2+)-induced increase of ROS. However, in t-BH mitochondria the effect of ADP on ROS was relatively small. We conclude that ADP potently restores CRC capacity in severely stressed mitochondria. This effect is most likely not related to a reduction in ROS production. As the effect of ADP relates to its concentration, increased ADP as occurs in the pathophysiological situation may protect mitochondrial integrity and function.